Sheffield ENIHL Scimitars call themselves the Spartans, as that used to be the ENL Sheffield team after the original Scimitars moved to EPL. Then, the Spartans became part of the Sheffield Ice Hockey Club and were renamed the ENIHL Scimitars, although to help everyone out they call themselves the Spartans. As regards Colegate's fight, well, it was his first for two years and it was a more even match this time than last. It's also the second fight of the season for the Lions that falls into the "not heavyweights but a decent showing nonetheless" category. Yeah i saw that fight, was pretty good, was shocked to see he was fighting with what looked like an already damaged hand/wrist. Would anyone going to Whitley this weekend do me a favour and say hi to a couple of people - specifically, the programme seller (go on, ask him how much!) and the woman in the green fleece. OK I will do, but last time we were there, IIRC, she wasn't wearing a green fleece! What can I say? Lions were unlucky last night. Warriors ran into major penalty trouble - they got 82 PIM with 3 10 minute misconducts, and Bryan Dunn got a Game at the end for a 2nd 10 minute. We had the better of the play, at times we put so much pressure on them but as usual we were stopped by a goalie on top form - Thomas Murdy kept them in it without a doubt. They scored 2 SHG from defensive errors, and one that floated in off Levers' shoulder. Again, the scoreline did flatter the victors - we comprehensively outshot them but it's difficult to know where the goals will come from. Oh and Ed, Mrs Green Fleece wasn't there, but we still had to deal with some "fans" who couldn't understand why we weren't really cheering, calling us miserable....!! 99% of Whitley fans have no sense of humour. Sadly, the other 1% can't ever make it to games. You guys may have been miserable - and having gone that far to see your team lose it's understandable - but that Whitley lot are a bunch of smug, overbearing gloaters. You know, like me, but they have silly accents. To the Lions fans who went up there last night, I'm sorry I couldn't make it, but to recreate the experience I sat in the cold for two hours, and then right at the end I turned off all the lights at the cafe end of my living room. A 4-1 reverse is generally good going for trips to Whitley, or as I like to refer to it, a town called The Past (seriously, if you've not been, the "welcome" sign says "set your watch back to 1959", and I don't mean 'almost 8pm'). The Warriors are consistently outshot and are always happy for the opposition to dominate possession, because their breakout offence is so lethal that all they have to do is wait and catch teams on the break. Their two SHG attest to this. While this result means the Lions probably won't win the league this year (even though it's early), it doesn't really affect our playoff chances. This weekend's game against Blackburn will though. The Hawks have been struggling for form recently and this weekend lost 5-3 to Kingston and Billingham. If we can get two points against them it will really help us out. We're one quarter of the way through the season and are in 5th place. The top four make the playoffs, and it's Sheffield (Lions lost twice), Whitley, Billingham and Coventry ahead of us. The chances are Sheffield and Whitley will get away from us, but if we can take points from the other two then the race will definitely begin to hot up. Bring on the Hawks! Who was the coach for the Lions in that game, I heard from a friend of a friend that it was a youngster from Nottingham. It was Adam Morris who is one of the junior coaches (sorry, don't know which team). He's a Level 2 coach which is good that we have young players and coaches coming through. Martyn was unavailable due to work commitments, and Mike was with the U-18's. Still we move on to Blackburn on Sunday, which will be after the Panthers game. Feel free to drop by, and keep an eye out for some news about possible changes that we may have to make for the weekend. Games against t'Awks are usually good, close, edge of the seat affairs and are often won by the odd goal. Earlier this season the Lions came back from Blackburn with the points. The team played better on Sunday than the scoreline suggests, but there are still points to work on and hopefully we can continue our relatively good home form, and stop this run of defeats. 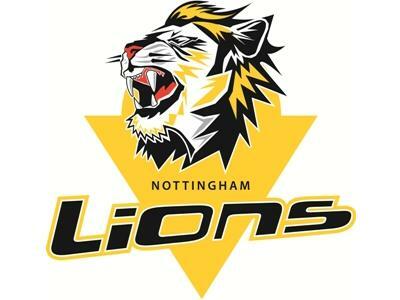 Nottingham Lions are offering tickets for just £3 for anyone with a ticket for Sunday's Panthers vs. Coventry game. The Lions take on rivals Blackburn Hawks in a game that is usually a high-tempo, tense affairs. The Hawks aren't getting the results so far this season, and are near the bottom of the table - they'll be looking for this result to kick-start their season, and the Lions are looking to halt their run of 2 successive 4-1 defeats, to Sheffield at home and Whitley Bay away last weekend. Also the Lions are looking for a couple of helpers for the game on Sunday. You'll have free entry but please remember you may not be able to watch the game. As it's going to be busy on Sunday we'd like people to help us on the door. If you'd like to help out on Sunday then please PM either me or Shaggy. what time is face off? Scorers for Lions were Chris Colegate, Sam Bullas, Joe Wightman, Ben Bliss and Josh Ward. Hawks' goals were scored by Carl Slater and Chris Arnone. Strange decision given by the ref (Hewitt) when there was a scuffle behind the net - saw 2 players from each side given straight 10's. I would have thought that it would have been 2+2s on each side. Still a far better display for the Lions. We're getting there finally! There were definately times when the Lions were just far superior to the Hawks - the lines have been mixed round and the Colegate - Bullas - Wightman line is looking dangerous at long last. Blackburn look to have some problems - which is a shame because they've always been a good team at this level. I hope that they pick themselves up soon becuase it's still going to be tough to call who's going to get what this season. It was a pretty good game with the Lions playing about the same as ever. This week we won because we had the speed to outskate Blackburn and the skill to beat their D and goalie, which ultimately led to a sieve chant, and because the team decided to stop playing defence at 4-0 this week, rather than 0-0. That having been said I thought the last ditch goalline stop, which I think was Norton, showed fantastic presence of mind. I had a similar view to the ref (I was just to the side of his right arm) and it definitely did not go in. Hopefully we can get a similar result next week against Whitley, although they will be a much tougher task than a struggling Blackburn side. If we can hit them early and get them on the back foot, then we may have a chance, but they are more than happy to sit back and wait for the opportunity to counterattack. Hope to see you all there. For anyone who is coming to tonights Game Vs Whitley Bay I have just been told it is in the main arena. Well it is with a very heavy heart that I am writing this post. On Tuesday of this week I put pen to paper and signed for the Solihull Barons, and I have just received confirmation that my release form has been signed. I wanted to say thank you to everyone that has helped me in my four seasons with the lions, but as I probably wont get to a lions training or game for a while i thought it appropriate to post on here. The decision to leave Nottingham was a hard one and it has taken me over a month to finally decide to sign for Solihull. I have had a great 4 years at a great club, and hope that one day when the time is again right i will be able to return. Winning both the league and Championship last season has got to be the highlight of my career so far and something that i will never forget. However, i just wasnt getting the ice time needed to improve my game this year, and so i have had to look elsewhere, where i have more of a chance of playing week in week out. Thanks to those on the cage who have supported me, especially thanks to Wigwam who was my sponsor last season. Thanks to all the friends of the lions for their hard work, and to Rich and Katie for putting up with me this season even when i was been a grumpy so and so! Good luck for the rest of the season, and hopefully i will see you all soon. all the best for your return to the Barons - you'll have your work cut out helping them try to catch up to current pacesetters Telford and Flintshire. The cat was let out of the bag on THF so thought i may as well post a farewell on here! I was going to put something together tonight to post on here, but you've saved me a job! Seriously, we wish you all the best for the future Luke. Sorry that your time here in Nottingham seemed to come to a bit of a sour end, but I'm glad you enjoyed yourself and that you are going to continue playing. Tell Adz to stop mucking around with rec and move his bum so i can come watch both of you!! don't worry, your 'ickle cheering section will be there!! Lions winning 2-0 after a period away tonight.